Luke Dang wanted to test himself this season. 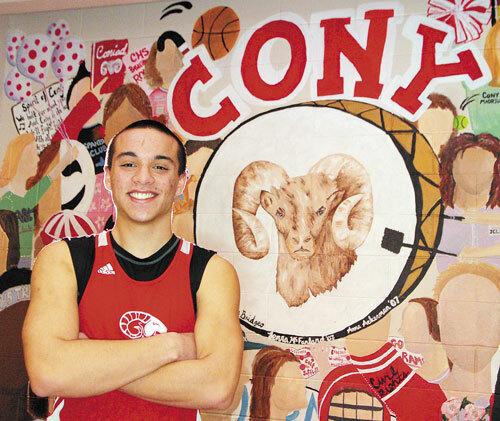 The Cony senior traveled to a few out-of-state meets this season to get an experience against the best competition possible. Dang competed in the Harvard Open at the beginning of the indoor track and field season, then participated in the Dartmouth Relays later in the season. “I did it to challenge myself,” Dang said. Competing against high school, college and professional runners, Dang ran a 6.90 in the 55-meter dash and a 23.01 in the 200 at the Harvard Open on Dec. 8 just after the Maine high school season kicked off. Dang ran a 6.89 in the 55 and a 37.15 in the 300 at the Dartmouth Relays against high school competition in January. His times dropped significantly later in the season. Dang finished second at the Class A state meet in the 55 with a time of 6.72. He also finished fourth in the 200 in 23.26. For his strong championship meet, Dang has been named the Kennebec Journal Boys Track and Field Athlete of the Year. Dang came into the season hoping to run in the low 23s in the 200 and to run 6.7 in the 55. Cony coach Peter Marsh feels that Dang’s participation in the prestigous, early-season meets helped Dang accomplish those goals. “Seeking out some of the top notch competition in the region, that really drove him through his workouts,” said Marsh, who competed in the pole vault at the Harvard Open. “It’s inspiring for him to be running against those open athletes, guys who can be in their mid 20s trying to qualify for money meets. Dang and Marsh both feel that Dang’s best event is the 200. That was the event Dang focused on the most throughout the season. He finished second at the Kennebec Valley Athletic Conference championships in the 200 last season with a time of 23.37 and was fourth at the state championship meet with a time of 23.45. He improved on that time at the Class A state championship meet, but missed out on a chance to win a conference title when a snowstorm forced the KVAC championship to be canceled. Marsh feels Dang may have a future as a multi-event athlete. In youth track, Dang participate in nearly every event with the exception of the pole vault and high jump. “He has the strength and stamnia and speed to be a multi-event guy,” Marsh said. Marsh said he tried to get Dang to pole vault for four years and said “he would have been amazing.” Marsh also believes that Dang will always be a sprinter at heart, which suits some of his strengths. Dang said he never sees himself doing anything other than sprints, joking he likes to stick to the ground. He’s not opposed to being an multi-eventer, but it is his preference to stick to sprinting. He hopes to continue his career at the University of Maine, where he plans to study accounting.